See Railroad Gazette 22 November 1901. Data supplemented and corrected by AT&SF 7 -1901 locomotive diagrams supplied in May 2005 by Allen Stanley from his extensive Rail Data Exchange. See also DeGolyer, Volume 24, p. 107. Information about how many, when, and by whom this class was supplied from http://atsf.railfan.net/atsfstea.html (also visited 6 Feb 2006), the Santa Fe All-Time Steam Roster maintained by Evan Werkema . Works numbers were 19578-19584, 19627-19634, 19642-19647 in October 1901; 19681-19684, 19721-19726, 19737-19740, 19764-19765, 19770 in November; and 19811-19812 in December. This big Prairie Vauclain compound design was designed for the La Junta-Albuquerque section, which had steep ascents between Trinidad and Raton in both directions (more than 3%). Baldwin's design offered a very big, long boiler and grate, such that the engine shouldn't ever have been short of steam. They came in two batches. 1000-1013 and 1014-1039. All had 79" drivers. Their cylinder pairs--1 LP and 1 HP--were each fed by a single 15" (381 mm) piston valve. Three were fitted with a Jacobs Shupert firebox; see Locobase 8257. Another 129 Vauclain compounds and 88 balanced compounds arrived over the next two years. Sylvan Woods reported that twelve of the 1014 and 1050 classes (1020, 1027, 1127, 1087, and 1070, inter alia) were equipped with Hobart Allfree cylinders. These had 12" main valves, one located at each end of a long steam chest, and a single 4" exhaust valve. See Locobase 7820 for a full description of this little-known variation of the more typical outside radial valve gear and valves. Sylvan Wood's survey of Santa Fe locomotives discussed the Hobart Allfree valve gear, commenting on an unwanted consequence of the poppet action. Although new installations with valves "in good shape" made for "very fast and powerful" engines, its action had unpleasant results: "The valve held the steam through most of the stroke, then let it loose all at once, losing the cushioning effect of conventional cylinders, thus resulting in broken rods, pistons, and keys." The AT&SF soon settled on 69" drivers for the type and later converted all those left in service to simple expansion. Werkema says that the later batch was simpled in 1912-1918 and the earlier group in 1922-1924. Drury (1993) says that part of the modification included fitting 69" drivers in 1922-1923. The catalogue notes that another 103 Prairies were built for fast freight service and fitted with 69" drivers; see Locobase 8229. Retirements began in 1941, with the last one leaving service in 1954. Data from AT&SF 6 -1927 locomotive diagrams supplied in August 2013 by Allen Stanley from his extensive Rail Data Exchange. Information about how many, when, and by whom this class was supplied from http://atsf.railfan.net/atsfstea.html (accessed 6 Feb 2006), the Santa Fe All-Time Steam Roster maintained by Evan Werkema. After the Santa Fe simpled its compound Prairies (Locobase 8258), it superheated them a few years later. For a while, 1136 appears to have kept its Stephenson link motion and original 4" (102 mm) deep frames. Locobase's data shows the variant that had the largest tender, thicker tires that increased driver diameter by an inch, and 6" (152 mm)frames. The result was a pretty hearty passenger locomotive that operated on many Santa Fe lines for decades. The design might have been a bit slippery at first (later upgrades raised the factor of adhesion), but few would cavil with the available power.. The last of these was retired in 1956 and a least a dozen were preserved. Data supplemented and corrected by AT&SF 7 -1901 locomotive diagrams supplied in May 2005 by Allen Stanley from his extensive Rail Data Exchange. See also Sylvan R. Wood, "Locomotives of the Atchison, Topeka & Santa Fe", Railway and Locomotive Historical Society Bulletin 75 (1949), p. 68. Information about how many, when, and by whom this class was supplied from http://atsf.railfan.net/atsfstea.html (also visited 6 Feb 2006), the Santa Fe All-Time Steam Roster maintained by Evan Werkema . Works numbers were 19578-19579, 19630 in October 1901. 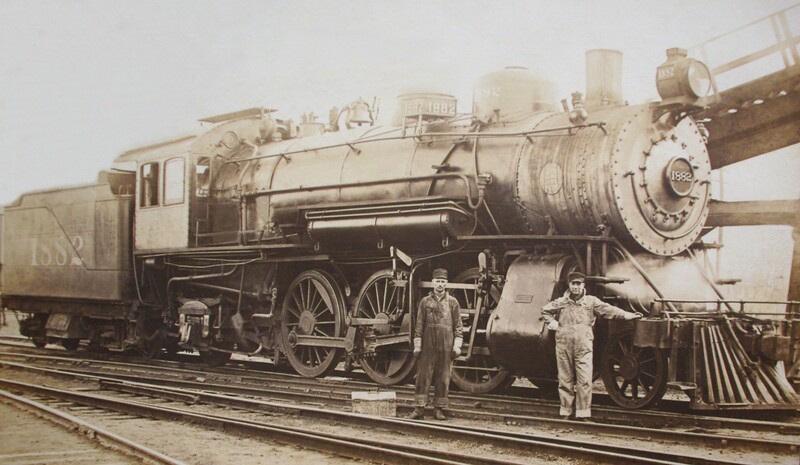 Among the first Prairies purchased by the Santa Fe (see Locobase 4125) were these three, which were fitted several years later with the stayless Jacobs Shupert firebox. See Locobase 463 for a description of this firebox design. This experiment in lower maintenance was not a long-term success, although the engines were still so equipped in 1920. Data from AT&SF 9 -1920 locomotive diagrams supplied in May 2005 by Allen Stanley from his extensive Rail Data Exchange. See also Sylvan R. Wood, "Locomotives of the Atchison, Topeka & Santa Fe, Railway and Locomotive Historical Society Bulletin 75 (1949), p. 68. Information about how many, when, and by whom this class was supplied from http://atsf.railfan.net/atsfstea.html (accessed 6 Feb 2006), the Santa Fe All-Time Steam Roster maintained by Evan Werkema. Although many US railroads converted their compound locomotives to simple-expansion layouts, few accompanied that change with a 10" (254 mm) decrease in driver diameter as in the case of the 1014-1039 batch of locomotive shown in 4125. The firebox now had four arch tubes aggregating 29 sq ft (2.69 sq m). Some kept their inside Stephenson link motion. Others traded it in for Walschaert outside radial gear, still others were fitted with Baker gear, and at least one (1072) used Southern valve gear. Initially most kept their original 4" deep frames. A later upgrade would include 6" frames. Sylvan Wood reported that twelve of the 1014 and 1050 classes (1020, 1027, 1070, 1078, 1087, 1112-1113, 1127, 1143, , inter alia) were equipped with Hobart Allfree cylinders. These had 12" (305 mm) main valves, one located at each end of a long steam chest, and a single 4" (102 mm) exhaust valve. See Locobase 7820 for a full description of this little-known variation of the more typical outside radial valve gear and valves. Wood commented on an unwanted consequence of the poppet action. Although new installations with valves "in good shape" made for "very fast and powerful" engines, its action had unpleasant results: "The valve held the steam through most of the stroke, then let it loose all at once, losing the cushioning effect of conventional cylinders, thus resulting in broken rods, pistons, and keys." Superheating the design involved several big changes; see Locobase 16241. Data from AT&SF 7 -1901 locomotive diagrams supplied in May 2005 by Allen Stanley from his extensive Rail Data Exchange. See also DeGolyer, Volume 24, p. 235; and Sylvan R. Wood, "Locomotives of the Atchison, Topeka & Santa Fe, Railway and Locomotive Historical Society Bulletin 75 (1949), p. 68.. Information about how many, when, and by whom this class was supplied from http://atsf.railfan.net/atsfstea.html (also visited 6 Feb 2006), the Santa Fe All-Time Steam Roster maintained by Evan Werkema . Locobase 4125 shows the express-passenger variant of this four-cylinder Vauclain compound Prairie design. In the present entry, the only difference is the diameter of the drivers. Of course, 69" drivers could still run, but they meant that the class was intended for a variety of services. Of the class, #1051 and 1125 supplied engine sets for a home-built 2-6-6-2 (1157). Simpling the class began in 1912 and continued until 1924 (see Locobase 8258), after which they served for decades. This set of balanced compounds capped AT&SF Prairie development; like all Baldwin balanced compounds, all four cylinders were arranged in line abreast under the smokebox. . This version of the basic Baldwin design used all four to drive the middle axle, raking the inside HP cylinders to seven degrees off the horizontal to clear the front axle and avoid the use of a forked main rod. RG added that the two cranks on each side were set 173 degrees apart (instead of the usual 180 degrees) to ensure that the pistons started their strokes at the same time. They were also among the biggest 2-6-2s built for any railroad. Drury (1993) describes them as "mainline freight power", an unusual role for the wheel arrangement. Baldwin attached a letter from the Santa Fe dated "Sept. 27" listing some relatively minor modifications to the 2-6-2s. The forward equalizing beam was too close to the radius bar crosstie that the letter said caused the beams to "hammer on all engines." It also had too little head clearance in fulcrum. And the rear equalizer was to be kept clear of the trailer flange. Three were completed with stayless Jacobs-Shupert fireboxes; see Locobase 8276. The class entered freight service on the Ft Madison, Ia to El Paso, Texas run. In the 1920s, this class was converted to simple expansion and were soon relegated to branch-line, mixed-traffic and local freight service. Retirements in 1940 and continued until 1955. Data from AT&SF 9 -1920 locomotive diagrams supplied in May 2005 by Allen Stanley from his extensive Rail Data Exchange. Information about how many, when, and by whom this class was supplied from http://atsf.railfan.net/atsfstea.html (accessed 6 Feb 2006), the Santa Fe All-Time Steam Roster maintained by Evan Werkema. In the 1920s, this class was converted to simple expansion and were soon relegated to branch-line, mixed-traffic and local freight service. Retirements in 1940 and continued until 1955. Data from Santa Fe Locomotive Diagram archived at the Kansas Historical Foundation's Kansas Memories Digital Archives, specifically page 152--, last accessed 12 December 2014. See also Interstate Commerce Commission, Locomotive Boiler Explosion, Canadian, Texas, 1951, Report #3396 at http://www.discity.com/explosions/boiler/atsfrrtex/, Google cache last accessed 14 September 2011. When locomotive 1805 suffered a boiler explosion in Canadian, Tex on 1 April 1951, the inspection report that followed contained data on the simpled version of the 1800 and 1857-class Prairies (Locobases 5387 and 13151)). All of the engines were converted between January 1924 (1835) and April 1929 (1869). The class burned either coal or oil; the specs represent the oil burners. Firebox heating surface area for either version included 29 sq ft (2.7 sq m) in four arch tubes. Coal burning engines put more weight on the drivers (194,100 lb), although it was more evenly distributed than the oil-burners' loadings shown above. The engine's overall weight was higher as well (279,000 lb). By the end of steam, the class trailed tenders with three different oil fuel and water capacities. The new cylinder arrangement delivered a healthy amount of power, although in later years (if 1805's 1951 setting was typical) the pressure was reduced to 200 psi. Data from DeGolyer, Volume 29, p. 44; and AT&SF 9 -1920 locomotive diagrams supplied in May 2005 by Allen Stanley from his extensive Rail Data Exchange. Information about how many, when, and by whom this class was supplied from http://atsf.railfan.net/atsfstea.html (accessed 6 Feb 2006), the Santa Fe All-Time Steam Roster maintained by Evan Werkema. Works numbers were 30266 in February 1907, 31106 in June, and 31210 in July. The 1800 and 1857 classes (Locobases 5357 and 13151) were four-cylinder balanced compounds. One 1800-class and two 1857s were fitted with stayless Jacobs Shupert fireboxes and that data is shown in the current entry (see Locobase 463 for a description of this firebox design). 1855 had that class's 17 1/2" HP and 29" LP cylinders. The class was simpled in 1926-1929. The Santa Fe and Baldwin tweaked the balanced compound design first produced in 1906 (Locobase 5387) by increasing cylinder volume. The other design elements remained essentially unchanged including raking the inside HP cylinders to 7 degrees off the horizontal to clear the front axle and avoid the use of a forked main rod. Baldwin estimated the compound tractive effort at 40,265 lb (18,264 kg). The original estimated tender weight of 168,000 lb envisioned carrying 9,000 US gallons (34,065 litres). The later diagram shows slightly less water. See Locobase 6322 for the conversion of both the 1800 and the 1857 classes to a common simple-expansion system and superheated boiler. Other than retaining the larger cylinder volume of the original 1907 balanced-compound Prairies, these engines were very similar to the superheated upgrade (Locobase 8277) of the slightly earlier 1800s. Beginning in 1926, class was converted to simple expansion (Locobase 6322) and were soon relegated to branch-line, mixed-traffic and local freight service. Retirements began in 1940 and continued until 1955. Data from AT&SF 7 -1901 locomotive diagrams supplied in May 2005 by Allen Stanley from his extensive Rail Data Exchange. Information about how many, when, and by whom this class was supplied from http://atsf.railfan.net/atsfstea.html (also visited 6 Feb 2006), the Santa Fe All-Time Steam Roster maintained by Evan Werkema . Works numbers were 25338-25339 in January 1902. In Locobase 4125, we describe the 79" express passenger version of this prolifically supplied Vauclain-compound Prairie design. Although the 1902 description of locomotives shows the 17" cylinders found on the 1000 class, the 1901 diagram shows 16" in large numbers. Like all of the compound engines, this pair was converted to a simple-expansion layout (the two undertaken in 1918).